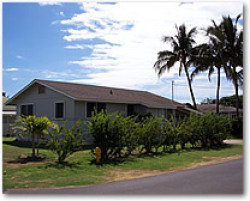 The recently renovated Kekaha Sunset Cottage vacation rental features comfortable, high-quality, Island-themed furnishings and accents and has a fully equipped kitchen with all new appliances, laundry facilities, an outdoor shower, covered parking and a lawn area for outdoor BBQ's and sunbathing. The living room features a 32" flat screen TV with surround sound for your entertainment pleasure. Enjoy your meals in the dining room on a custom-made Teak table with six chairs. The Cottage has three bedrooms and one full bath. There is a King Bed, a Queen Bed and two twin beds beautifully adorned with luxurious, high thread count linens and bedspreads. 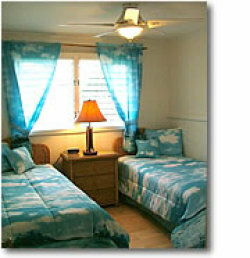 Each bedroom has a ceiling fan and jalousie windows inviting the tropical ocean breezes inside to keep you cool and comfortable during your visit at the cottage. You can even hear the ocean from the bedrooms as you wake. 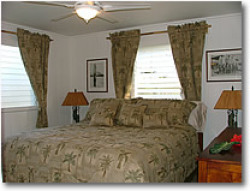 Every window in the cottage is accented with high quality, tropical-themed curtains and drapes. The bedrooms feature mirrored closet doors and beautiful teak dressers and nightstands. The floors throughout the Kekaha Sunset Cottage are Maple laminate. The bathroom has a tiled countertop and floor, a bathtub and shower, glass shelving, and quality chrome bath fixtures. 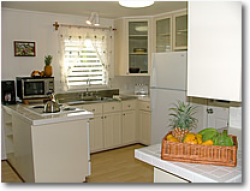 The kitchen features tile counters and the original stainless steel sink has been restored to perfection. There is an electric stove and oven, a microwave oven, a coffee maker, a toaster and a blender for creating cool, tropical refreshments. The wood cabinets feature glass fronts and chrome pulls. The owners have featured many of their breathtaking and nostalgic photographs of Kauai and the Hawaiian Islands for your enjoyment.